← PilotEdge in Redbird on AOPA Live! 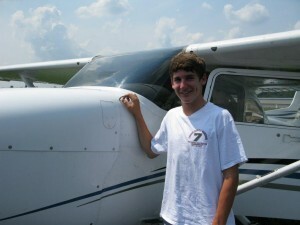 Nate Alexander – First Solo!!! Congratulations! Nate Alexander after his FIRST SOLO with Skyhawk 5491J! Congratulations to Nate Alexander of Franklin Lakes, New Jersey! Nate flew solo for the first time ever today, 3 August 2012, with instructor Todd Libke cheering him on! As Pilot-In-Command, Nate made three beautiful takeoff and landings on N07′s Runway 19. Congratulations from all of us at Aero Safety Training, Nate! We’re all very happy for you and we’re looking forward to hearing all about your upcoming cross-country adventures! One Response to Nate Alexander – First Solo!!! Congratulations!